Add remaining 2 Tbsp. oil to skillet and heat over medium-high. Arrange mushrooms in pan in a single layer and cook, undisturbed, until golden brown underneath, about 3 minutes. Season with salt and pepper, toss, and continue to cook, tossing often, until golden brown all over, about 5 minutes. Transfer to bowl with dressing, but don’t toss. Strip rosemary leaves off stems into bowl and add chicory. If your friends’ group chat is anything like mine, you’ve probably experienced that moment of panic as your plans to hang and make dinner for yourself and a friend or two balloons into cooking for the whole squad. This happened to me just this past week. The low-key hangout I really needed became dinner for six before I knew it. But, I didn’t have time to sweat it—I had a full-fledged kickback on my hands, and these people needed to eat. Luckily for me, I had a brand spankin’ new Basically recipe up my sleeve. 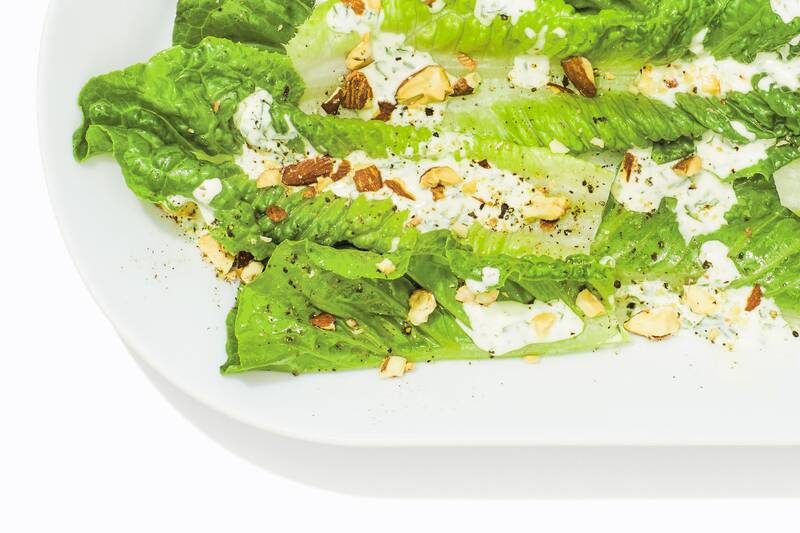 This romaine salad—Every Night Salad with Yogurt Ranch, if we’re being specific—uses super basic pantry staples to make something that looks and tastes like you spent all day shopping and cooking. So, with my internal countdown clock ticking (aka the swarm of “OMW!!! 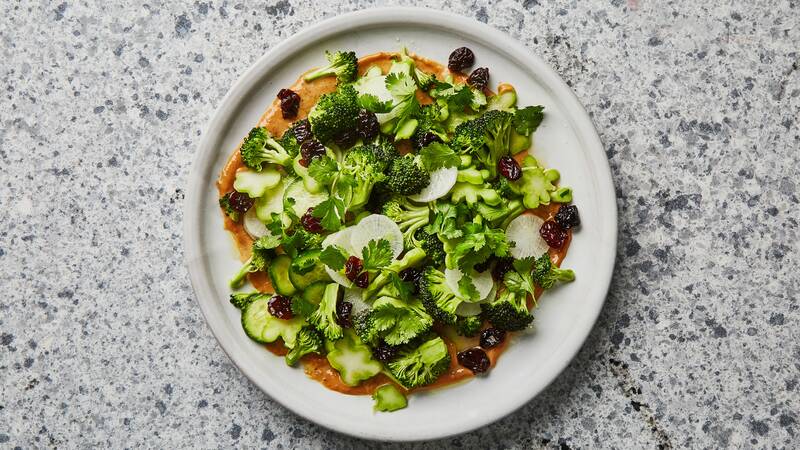 !” texts buzzing on my phone), I evaluated the contents of my fridge and dashed to the store to re-up on the couple of ingredients I needed to bring the whole thing together. Now, if you’re thinking that salad isn’t exactly the life of the party, I get it. Bunches of sad-looking mesclun mix and boxed croutons aren’t exactly my idea of fun either. But you know what does get me going? 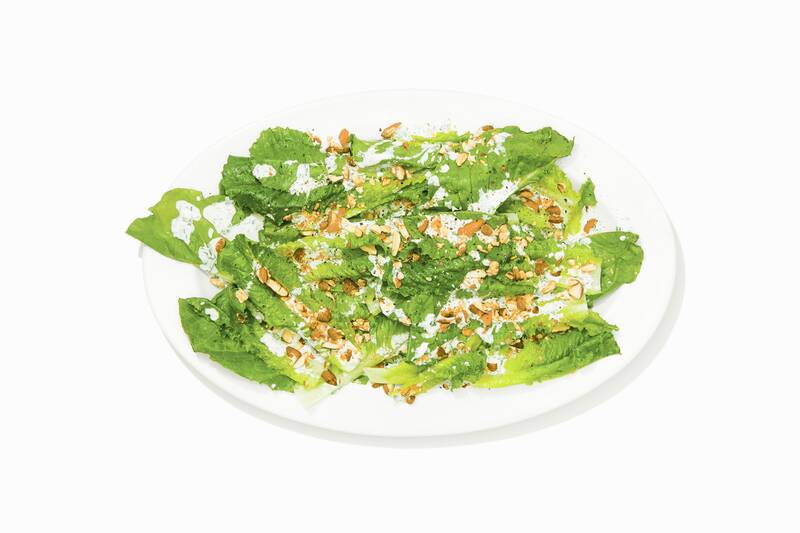 Crunchy, crispy mouthfuls of cold romaine! Bright flashes of tart lemon and yogurt! Comforting hits of salt and heat from crushed almonds and garlic! With so much flavor in such a simple package, I could serve my friends a satisfying salad and still have the bandwidth to, you know, hang out with them. While I was still waiting for company to arrive, I bumped some music, prepped my work space, and breathed easy knowing it would only take me about 20 minutes to throw the whole thing together (dance breaks included). I grated my garlic, juiced my lemon, chopped my herbs, and whisked, whisked, whisked it all together with rich, full-fat yogurt and a bit of store-bought mayo. Once the dressing was done, I slid on over to my leafy greens. The best salads are dressed twice. Now, here’s the key to making a salad really shine: Dress it not once, but twice. Yeah, you read that right. (Well, you probably did.) No matter how delicious your dressing is, you still need to make sure that every leaf of lettuce gets a good hit of acid, fat, and salt before anything else happens—forgetting this is why so many salads fall flat. Here, I tossed the romaine leaves with a squeeze of lemon juice, a drizzle of olive oil, and a big pinch of kosher salt to give the dressing a beautiful foundation to build on. Once my greens were in order, I went back to my dressing. I gave it a taste, and since my lemons were kind of big, the whole thing skewed a bit tart; to compensate, added another spoonful of mayo to the mix get the the fat-acid balance right. I dipped a leaf of pre-dressed lettuce in to make sure the whole package worked. Bingo: just salty enough, creamy enough, and tangy enough, with a good hit of garlicky heat. I was in business. When the doorbell rang, I whipped out a platter and carefully built my salad, layering lettuce, dressing, and crushed almonds to make sure that every bite was a winner. After throwing on a pair of pants, I was ready to play hostess with the mostest and field compliments all night because yes, this was a breeze. And yes, my friends can come back anytime. They’ll just have to give me a little more of a heads up next time.